On Craigslist, there’s always been a scam; a scam so universal that it is practically ‘The Scam”. 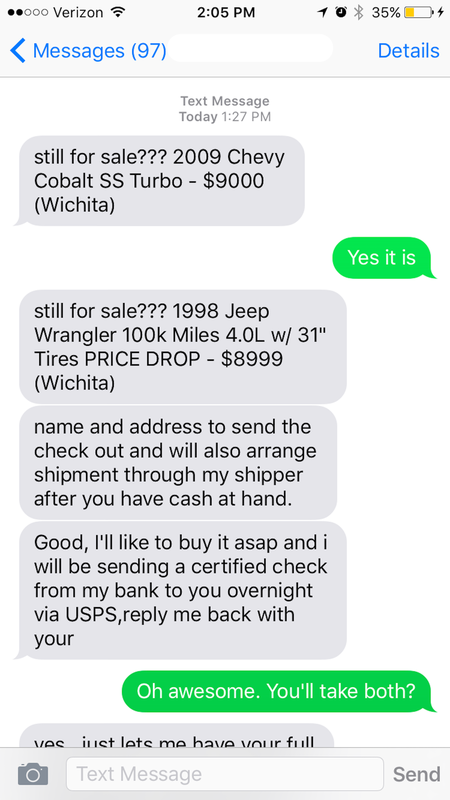 For someone selling one car, you might get this text maybe once or twice a week. I get these texts about 4 to 5 times a day now. Lucky me. You can read this series and more on our new site, Fast Not Loud, a site for car enthusiasts who actually drive cars before forming opinions. The scammer agrees to buy in full price, sometimes more. The scammer will be using check/PayPal. The scammer will have shipping arranged for you. Normally, I just ignore these texts. It wasn’t until recently that I discovered there was an actual person behind the messages and not an some sort of automated system. So lately, I’ve decided to have a bit of fun and played along. As it turns out, these scammers have no knowledge of American pop culture, so my test now is to see how absurd I can make the lies. I’ll have more to update coming soon.